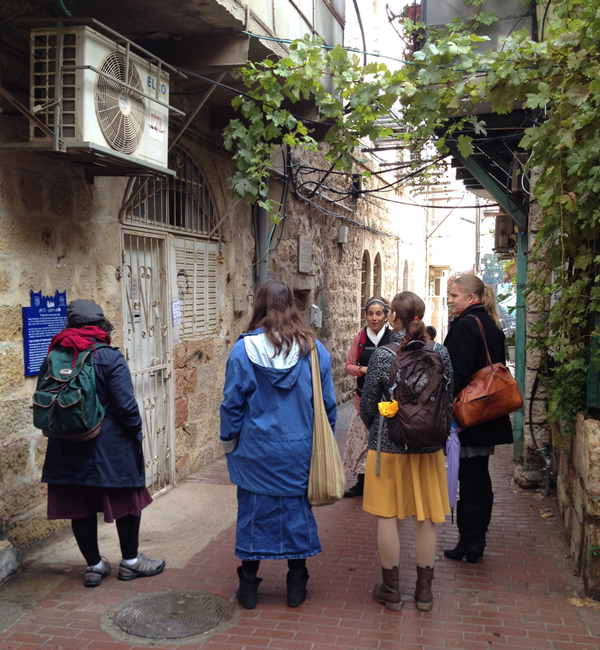 Today I was lucky enough to be one of the women on Chana Mason’s Shuk & Nachalot walk here in Jerusalem. 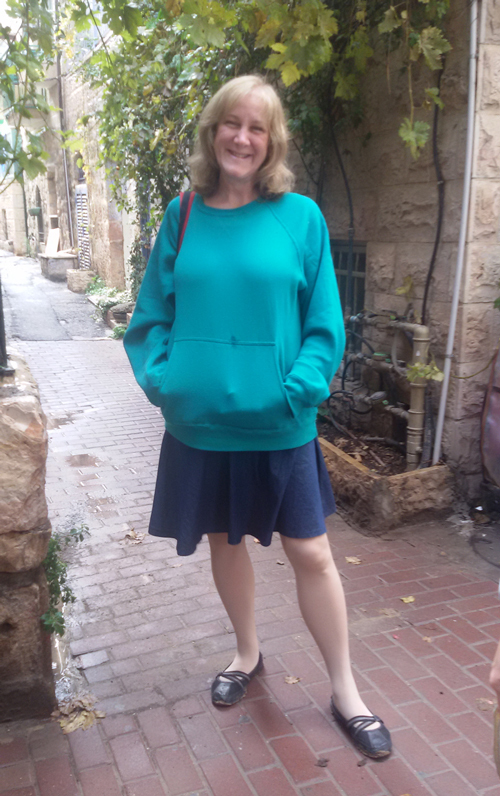 The winter morning was cold and rainy and my coat was in Tzfat, so it wasn’t an ideal day for me weather-wise, but I was not missing this walk! Happily, the sun came out as we got started. And if it didn’t that would have been OK because Chana Mason simply brings the sunshine with her fabulous spirit. Tucked away off of Jaffo Street is a neighborhood and history that I knew nothing about, although I’d once accidentally come upon a bit of it. On her walk-tour, Chana brought it to life. 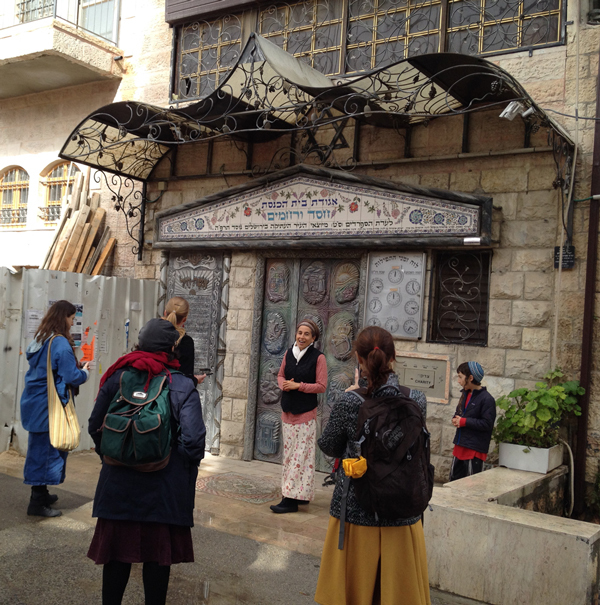 We learned about Rabbi Aryeh Levin on his street. I got a picture of Jerusalem in the 1880s, a period in which Jews from all over Europe were able to make their way back to their homeland. Jerusalem as this walled city filled to the brim and people needed to expand, living outside of the protection of the city walls while arrows flew. Zivile, my Lithuanian friend I met in Vilnius, took this rare photo of me as we toured. We visited a beautiful synagogue I already discovered and love. Now I know how it came to be and who built it. I am not going to share the details here because I think everyone should visit Israel and Jerusalem to learn about life, both present and past. Chana will be here when you get here. Leaving the quiet of Nachalot and the beauty of a synagogue not to be missed, we came to the shuk area. 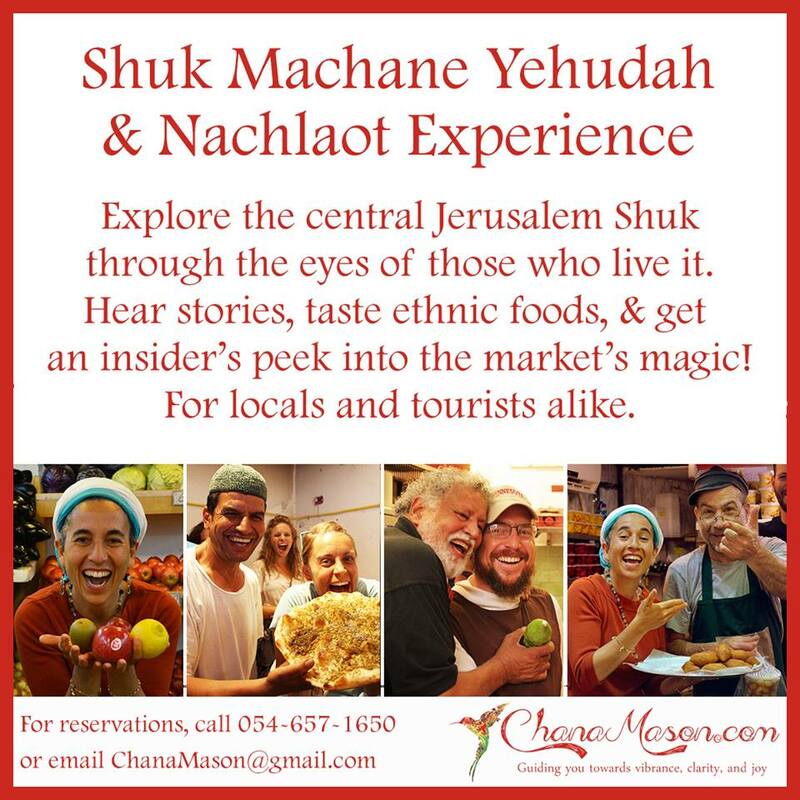 “The shuk” in Jerusalem is the Machane Yehuda market. A shuk is a market or outdoor market. If you’re an American you can kind of relate this to a “farmer’s market” — a bit. A shuk is a different energy. 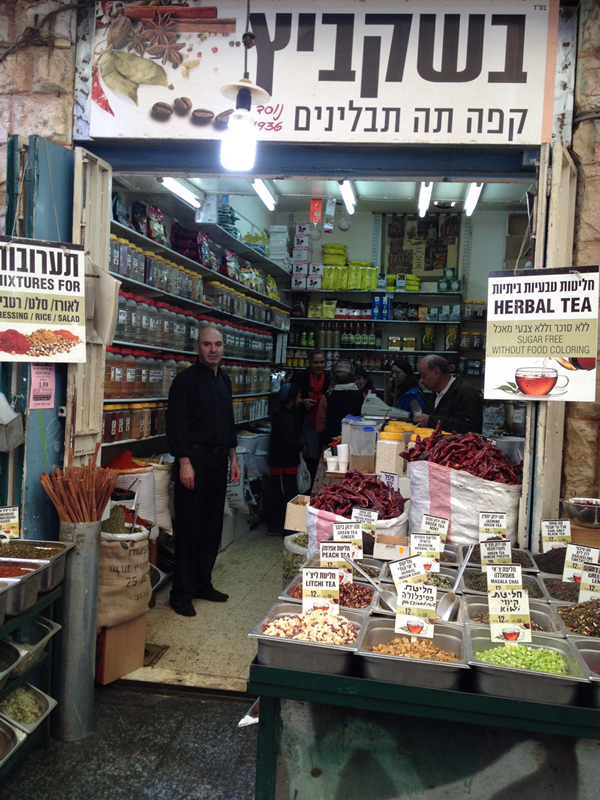 I’d wandered the shuk on my own several times, but never found most of the places she took us. With Chana we also got special tastings. Our first stop was a tiny bakery that sells its bread from its sidewalk-front table. Hasun invited us into his bakery, Haba Bakery and taught us about his unique bread, Ash Tanur as Chana translated. As you see, the bread is baked on the round sides of the oven. It’s fun to see it stick to the oven walls and bubble as it bakes. Below, you can see how he shapes the bread and puts it into the oven. 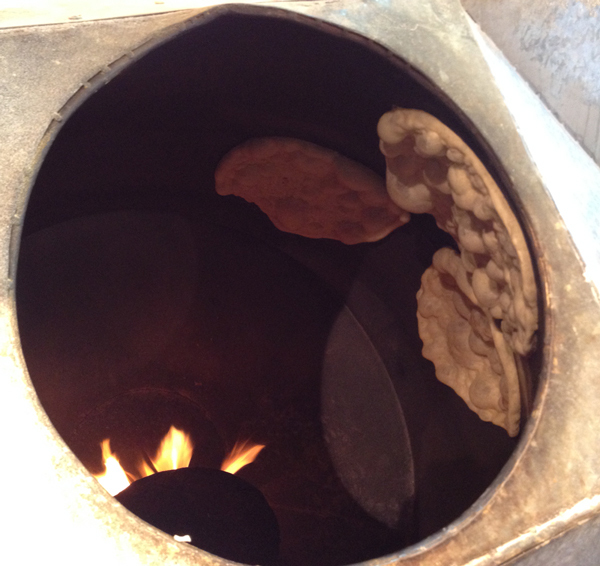 Ash Tanur, the name of this bread means “life of the oven” because the round oven is like a mother’s womb. It is made without sugar and is terrific when fresh and hot, or warmed up again later. Moving on, we learned about juices and their medicinal values. At another shop, we saw Tahina being made right on the spot and got to taste it. We had some terrific dried cherry tomatoes and cheeses. I came home with some Tzfat cheese which is a goat cheese, and some excellent mozzarella. She shared information about fish. She showed us where someone makes rice cakes and buckwheat cakes on the spot. Oh, how nice a fresh, hot buckwheat cake tastes! And you buy them on the spot for a better price than I found in shops, of course. Nissan, our favorite spice man. Chana shared her favorite spice shop where we learned about spices from Chana and Nissan. Ah, the aroma of their cinnamon and oregano…. I happily have several of their spices in my home now. Yep, I finally have Zaatar, too! I love that I am now personally connected to some of the best people at this famous and important Jerusalem shuk. Others on our walk felt the same way, so I believe that anyone coming to Jerusalem for a while would benefit from this. And I love Chana. You can find out more about Chana Mason at ChanaMason.com. I invite you to save and pass around this digital flier of hers, too. This informational walk is just one of the things she does for people. PS: I returned to the shuk with a friend a week later and it was fun to be known and remembered by the vendors I returned to. I did achieve that on my own in Tel Aviv’s Hatikva Shuk, but the Machane Yehuda shuk has so very many people coming through that I hadn’t achieved this on my own here in Jerusalem. Thank you again, Chana Mason. Thanks for sharing such a great experience! Especially at this time of the year when it is all too easy to allow ourselves to be focused too much on all the negative things happening in the world! This let me relive the tour which I took part in! Chana Mason is the best and so is Deb writing this blog. I am enjoying reading every word in your blog. I feel I am right there with you touring the amazing sites and behind the scene action. Your information is so insightful. Thanks for sharing your adventure with the rest of us that have not yet been fortunate to travel to Israel. I look forward to reading more of your posts, no matter where in the world you find yourself. Safe travels Deb.